You all know how much I love to bake cookies. I mean, the evidence is there. And here. And here, etc. 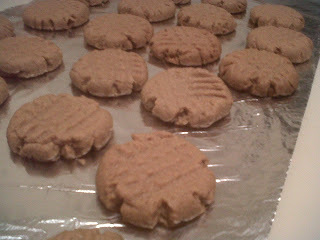 But the other night I had a craving for peanut butter cookies and milk, and the only thing to do was to stealth bake (That’s when you didn’t mean to bake, and still aren’t sure you’re going to follow through, but then you find yourself looking up a recipe and mixing dough, and all of a sudden you’ve got a table covered in cookies. Oh wait, that’s just me all the time? Sorry about that…). This might be the easiest peanut butter cookie recipe of all time. I can’t verify that objectively, but it’s certainly the simplest I’ve seen (in my short life). So take a gander, check out my spin on it, and feel free to make changes, bake, and get a little peanut buttery in your own life. Yay! Mix ingredients until blended. If dough seems too sticky, add extra sugar. Roll into 1-inch balls and place on cookie sheet. Flatten with fork tines, creating a criss-cross pattern. Bake for 12-15 minutes. Best if slightly undercooked (and just a tad chewy). Makes 36 cookies. 3 ingredients? That's outrageous. Those look delicious, thanks! I'm afraid I won't be able to make them -- That would mean I would eat them, too. And then I would have to work out more. But when I got home from the gym, they would still be there and I would eat some more, with milk. PB and Snickerdoodle cookies are my favorites. Laina: Indeed - no flour. The peanut butter has a lot of texture on its own. I'm with Ryan! This sounds yummy! ok, they're in the oven. i only had the organic pb, so had to play around with the proportions of it and the sugar. and when i was pouring the vanilla, a bit more splashed out than expected. hmmm, i see why the organic is not so good. there seems to be a thin layer that oozed from the bottom. gotta do the taste test after it cools. ok, taste test done. was yummy but crunchy instead of chewy. Cookies with no flour? Love that! Must make these.